Default Material Set a reference to the default Physics Material to use if none has been assigned to an individual Collider. Sleep Threshold Set a global energy threshold, below which a non-kinematic Rigidbody (that is, one that is not controlled by the physics system) may go to sleep. When a Rigidbody is sleeping, it is not updated every frame, making it less resource-intensive. If a Rigidbody’s kinetic energy divided by its mass is below this threshold, it is a candidate for sleeping. Default Contact Offset Set the distance the collision detection system uses to generate collision contacts. The value must be positive, and if set too close to zero, it can cause jitter. This is set to 0.01 by default. Colliders only generate collision contacts if their distance is less than the sum of their contact offset values. PCM is more efficient, but for older projects, you might find it easier to continue using SAT, to avoid needing to retweak physics slightly. PCM can result in a slightly different bounce, and fewer useless contacts end up in the contacts buffers (that is, the arrays you get in the Collision instance passed to OnCollisionEnter, OnCollisionStay, and OnCollisionExit). Auto Sync Transforms Enable this option to automatically sync transform changes with the physics system whenever a Transform component changes. Enable Enhanced Determinism Simulation in the scene is consistent regardless the actors present, provided that the game inserts the actors in a deterministic order. This mode sacrifices some performance to ensure this additional determinism. 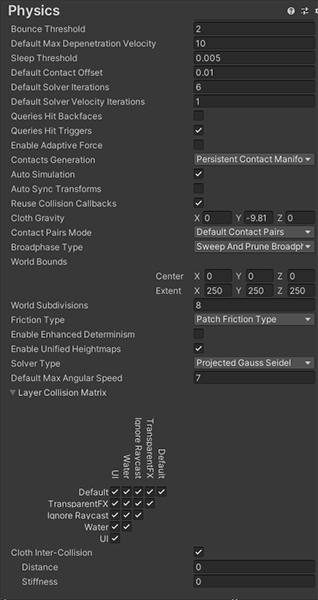 Enable Unified Heightmaps Enable this option to process Terrain collisions in the same way as Mesh collisions.